Hello and welcome to your next stop on the National Craft Month Celebration Blog Hop! I am so excited and honored to be a part of this event! A big THANK YOU to Nicole from Right At Home for organizing the party and for inviting me to join in on the fun!!! 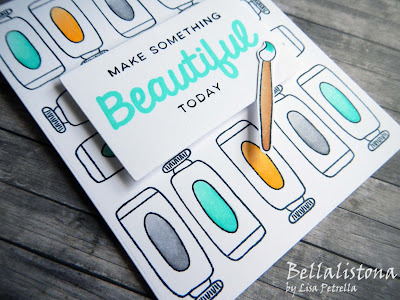 My card features the new Make Something Beautiful stamp set from Right At Home. LOVE it!!! To start I die-cut a 4.25" x 5.5" rectangle from white cardstock. 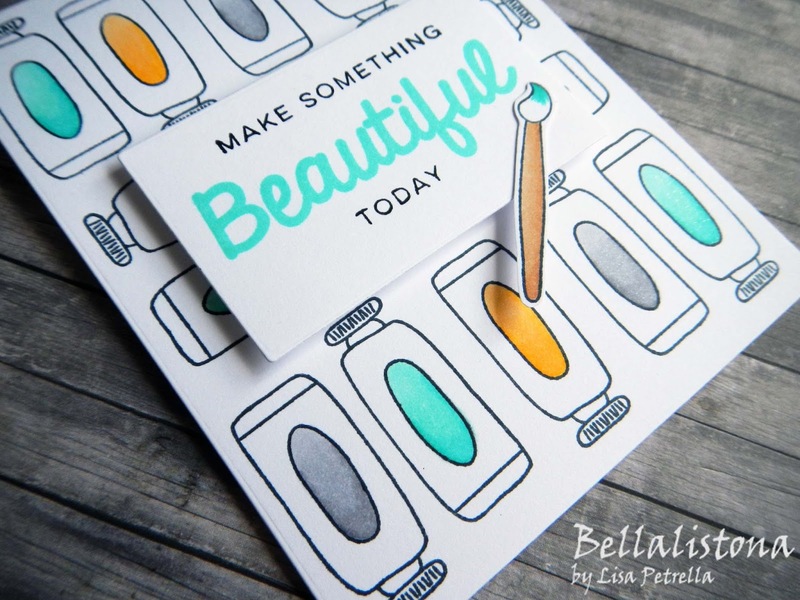 I repeatedly stamped the paint tubes in a fun pattern, added some color with markers, and adhered the stamped panel to a white A2 card base. I did a little bit of surgery on the sentiment stamp so that I could easily stamp the word "Beautiful" in Merman ink and the rest of the words in black. I adhered the sentiment panel with foam adhesive squares to add some dimension. I stamped the paintbrush, colored it with markers, cut it out, and then added it to the panel as shown. To finish off I used a glitter pen to add some sparkle to the colored parts of the paint tubes, the word "Beautiful" and the tip of the paintbrush. 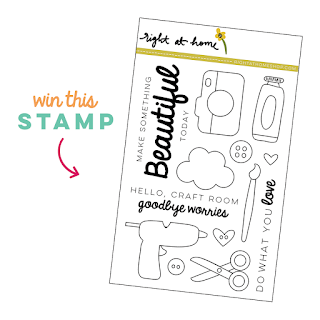 How would you like a chance to win this stamp set? Well...Right At Home is having a giveaway on their blog! Just hop along and leave comments at each stop for a chance to win. YAY! Thanks so much for celebrating with us today!!! Your next stop on the hop is my super sweet and talented friend, Linda Nomura!!!!! Lisa! I love this! LOVE your color choices! 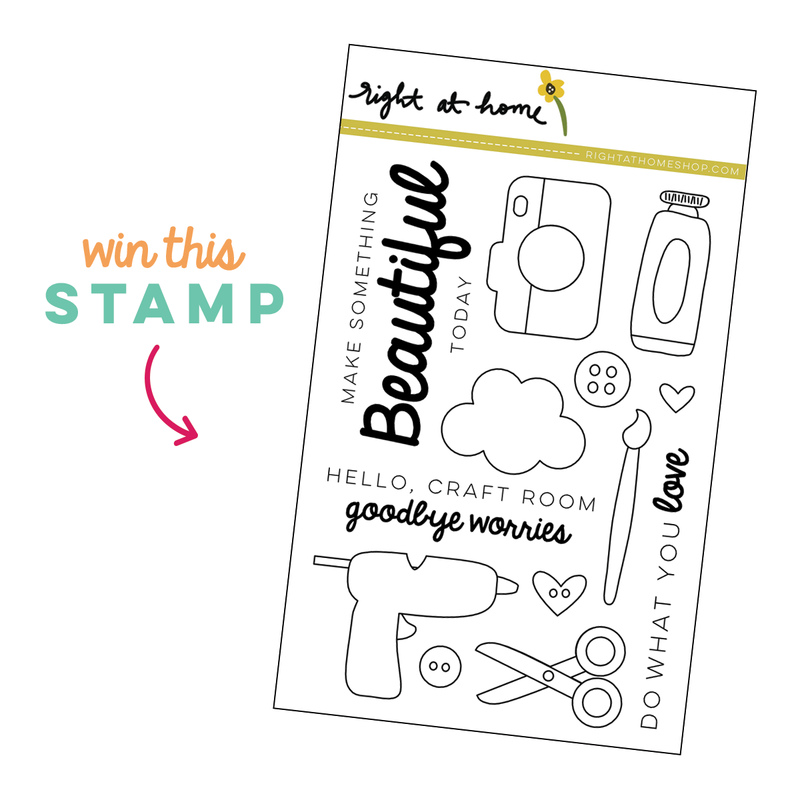 This is a cute stamp set and is pretty much a lot of what we use. This company is new to me so thank you for the introduction. I like your cute card and how you did the sentiment. The sentiments in this set are perfect, especially Hello, craft room, goodbye worries. This is amazing! I love the clean and fresh look and the colors are AWESOME!! Miss you tons, Lisa. Love seeing all your gorgeous cards and CO pics! Very cute design with just a little pop of color. 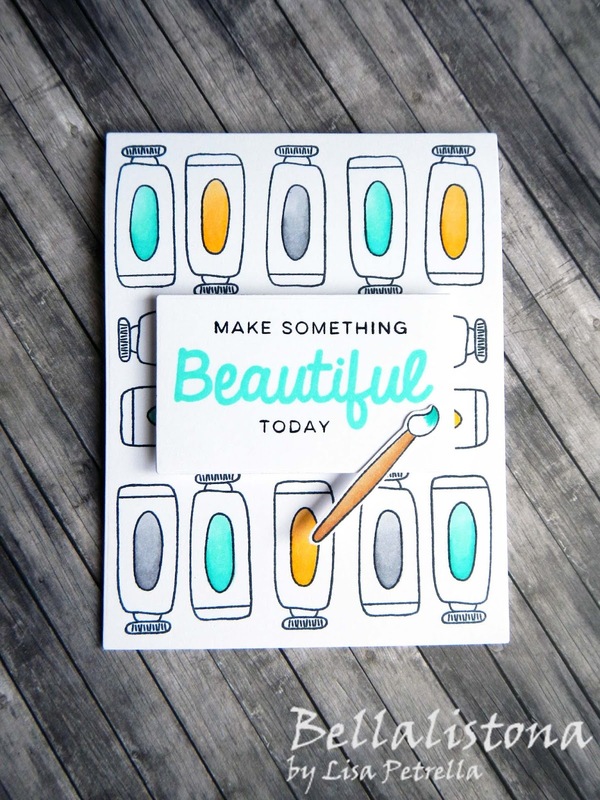 Love these fun crafty images! Great design - lions your color choices! 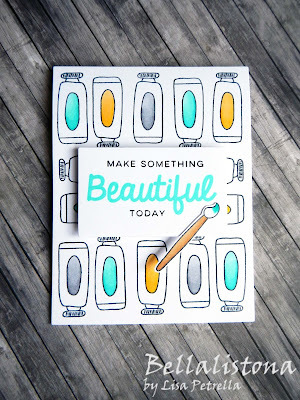 Awesome color choices on your fun card! Such an awesome design by lining the paint tubes up. Great color choice too!! I love this! The colors are fabulous! Nice stacking the paint tubes and then having your paint brush put an explanation on your card's point! Great color combo! Super cute stamp set! Thanks for sharing! Thanks for sharing your beautiful project. I love the paint tubes all lined up. Fab interesting fun design...love it!!! Cute use of the paint tube image, which I missed noticing. Thanks for sharing. Lisa I just love your CAS design! Using just the paint tubes in yellow and blue look fantastic! Can't wait to see you next week! OH my gosh friend! This is fabulous! I love the bright pops of colour. So fun. Such a fun project - love this stamp set! Wonderful graphic design! Love the use of minimal colours.